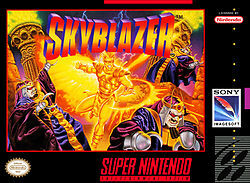 Skyblazer, released in Japan as Karuraou (迦楼羅王? ), is a platform video game published by Sony Imagesoft, released in early 1994 for the Super Nintendo Entertainment System. It involves Sky, the Skyblazer hero (Garuda in the Japanese version) searching for Ashura, the Lord of War, who had kidnapped the sorceress Ariana (Vishnu in the Japanese version). There are a total of 17 levels with a few more stops on the map where the elder (Brahma in the Japanese version) gives passwords to the player and ten bosses including the final boss, Raglan (Ravana in the Japanese version). Four of those must be fought twice, since they reappear immediately before Ashura, who appears before Raglan. An overhead map allows for movement between levels, including back to ones already completed, and its slight non-linearity allows the player to skip some levels (at the cost of the magic spells and other powerups obtainable in them). 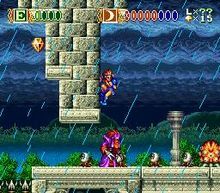 Most of the levels are side-scrolling, but there are some levels involving flight, either automatically scrolling or in Mode 7, where the player can grab crystals towards extra lives but will exit the level upon touching a spike and falling. Also, some levels expand on the usual platform structure by including waterways whose paths can be varied with switches, and there are areas with rotating towers. Many of the bosses also use extensive Mode 7, expanding and rotating around the screen or coming in the form of rotating walls. There are eight secondary attacks available beyond the basic punch and kick, but unlike those they require magic power. Magic powerups, signified by flasks of red liquid in either small or large sizes, can replenish the power needed to use these while flasks of green fluid restore health. There are gems of both small and large sizes; a large gem counts the same as 10 small ones, and obtaining 100 gems will give a player an extra life. There are also outright 1-ups. Blood from the Japanese release was re-colored green for the Western Releases. GamePro lauded Skyblazer as "a great mix of side-scrolling action, puzzle solving, special powers, and tactics." They praised the high challenge, mythological setting, simple controls, and "inventive uses of Mode 7." Electronic Gaming Monthly scored the game a 7.8 out of 10, praising the challenge, graphics, and control. GameLemon gave the game a positive retrospective review. ^ "Skyblazer". MobyGames. Retrieved 2007-04-08. ^ "ProReview: Skyblazer". GamePro (53) (IDG). December 1993. p. 138. ^ "Review Crew: Sky Blazer [sic]". Electronic Gaming Monthly (54) (EGM Media, LLC). January 1994. p. 44. ^ Zeller, Mike. "The Top-Ten Most Under-Appreciated Games of All Time (part I)". GameLemon. Archived from the original on February 24, 2007. Retrieved 2007-04-08. This page was last modified on 3 September 2015, at 22:27.